The Catrike Trail is the perfect trike for those beginning to trike, as well as veterans, such as myself. As its name states, this trike is the master of all bicycle trails. With 27 gears and 20 inch wheels all around, the ease of climbing hills makes this a trail master. The seat height and angle give you an excellent view of all the beautiful bicycle trails have to offer. 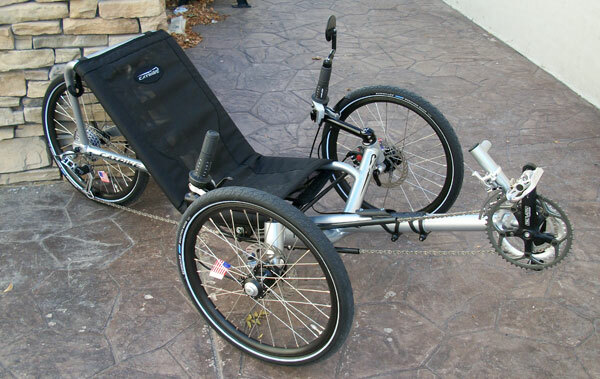 The Catrike frame is heat treated aircraft grade aluminum, which makes the trike considerably lighter than other models of trikes in its price range, weighing in at only 32 pounds. The first thing I noticed when I started riding the Trail was that the aluminum frame made the ride a little more rough than the ride on my older steel frame trike. At first this really bothered me because I was used to the flex of the steel frame that I had been commuting on,.but after a couple rides I didn't notice the rigidity and actually could feel that the stiffer frame helped me go faster. Recently, Catrike came out with a new padded seat mesh, and the side cushioning makes the seat much more comfortable to me. Initially when riding the Trail, I wondered how the seat height would affect the stability, but Catrike always thinks those things through. The wheel track is a little wider than their higher end models. It's not noticeably wider though and does feel very stable. The new mesh seat on the Catrikes has convenient pockets on the back, and holds the essentials of what you need with you always. The small pocket holds my wallet, keys and cell phone, and the large pocket holds a tool kit, spare tube, some tire levers, and an energy bar. There is also a space to hold a hand pump, which is a must for any ride. The first thing I noticed about the Catrikes was how awesome their direct steering is. The Trail is extremely maneuverable and has a very nice turning radius. 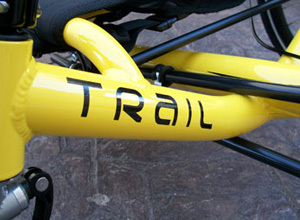 The Trail handles like a sports car as opposed to a luxury car. At first I was worried that the direct steering would make the trike easier to flip over at high speeds. Once again, I was mistaken. The ergonomic design of the trail makes the center of gravity low enough that the direct steering would not affect its stability. The gearing on the trail includes SRAM X5 gripshifts with a Truvativ Touro Triple crankset on the front, with a SRAM PG950 11-32 cassette in the back. The front derailleur is a 3 speed Microshift and the rear derailleur is a SRAM X5 9 speed. 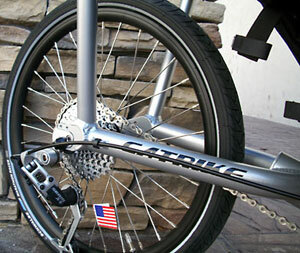 The combination of these components make this trike have mid-range grade quality and a good amount of gears. The gear inch range is approximately 18-88, which allows you to reach speeds of about 24 MPH at 90RPM and the ability to climb pretty intense hills. 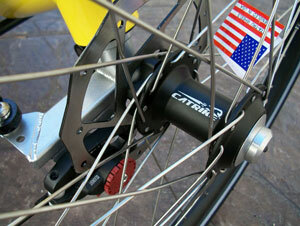 The Catrike aluminum wheels roll very smoothly. The tires that come stock with the Trail are Schwalbe Marathon tires. They are more puncture resistant than most tires, but if you want one of the most puncture resistant tires on the market, I'd suggest the Marathon Plus. I ended up getting several flats during my first week of commuting and finally switched over. If you live in an area with better roads and no Goat Head stickers you'll be fine with the stock tires. Overall, the reason I went with the Trail over other Catrike models was the seat angle and height. It doesn't make my neck tired on long rides, and its not too high off the ground, so I don't feel like I'm going to tip over during fast turns. The seat is not quite as high as the Villager, but a little bit higher than the Pocket. It is easier for me to get in and out of than the models above it, which is a big deal for me because of my recent back injury. I also live in a really hilly area, so the 20" tires was a good choice because they handle hills very easy with a nice low gear. Krysti currently commutes almost daily on her custom neon-green Catrike Trail. 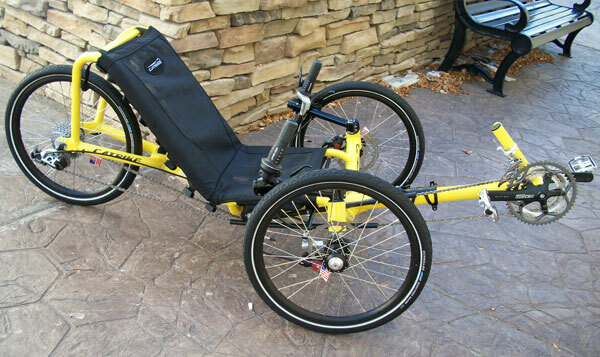 For more details on this trike visit our Catrike Trail Page. 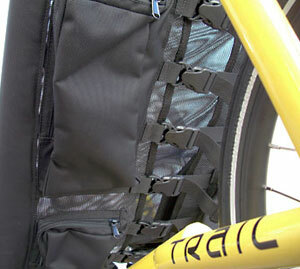 We offer many different ways to customize the Trail including color and gearing options. All our Trails ship fully assembled to anywhere in the USA.